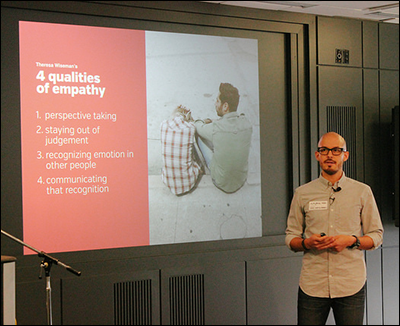 At the 45th gathering of the Chicago chapter of CreativeMornings, interaction designer Antonio Garcia addressed the concept of “Empathy,” CreativeMornings’ global theme for August. His talk focused on truly understanding another person and what she or he is feeling, compared to the ease of being presumptive and condescending. To act in a hospitable manner. He issued a the tall order: “Be excellent to each other.” It serves as homework, for humans excel at behaving inconsistently, particularly toward each other. Garcia is part of mass communicating a legacy-deep principle, a popular challenge to be mindful of, in practice. Yet, there were moments when Garcia himself sounded insensitive in his talk. While championing the importance of primary research, going into the field and talking with “end users” to help inform a project, he proclaimed another method of conducting group surveys as “stupid.” I thought about companies who rely on this activity in order to help, if anything, give access to findings that surveys, whether in the form of focus groups or not, can provide. How does Garcia’s quip affect all those who specialize in making and analyzing surveys, who make it their livelihood? Some input from end users, whether through surveys or not, can prove better than none. The Golden Rule, like other virtuous aspirations, was never meant to be easy to execute moment to moment. But it is, to channel the pioneering computer scientist Alan Turing, a “differential equation,” not a “boundary condition.” As humans excel at doing and redoing, the drive to realize human solidarity remains relentless. After Garcia’s talk, there was a tweet by creative director Will Miller, who made a presentation at the 22nd monthly gathering of CreativeMornings/Chicago (my write-up). Miller called Garcia “a hero to all!” My quick reaction: “Whaaaaat?” I associate such a noble label with people who directly save people’s lives. For example, recall Chris Mintz, an Army veteran, who helped save Umpqua Community College students from a gunman loose on its campus in Oregon on October 1, 2015. Mint even tried to minimize the dangerous situation by talking to the gunman. During his courageous engagement in bringing students and staff to safety, and his attempt to influence the gunman, Mintz was shot five times. It’s a reassuring fact that we live in world where empathy can be noticed and, at the same time, support the cautious confidence in humanity. Garcia is a member of “innovation consultancy” Gravity Tank, where the first gathering was held to launch CreativeMornings in Chicago. 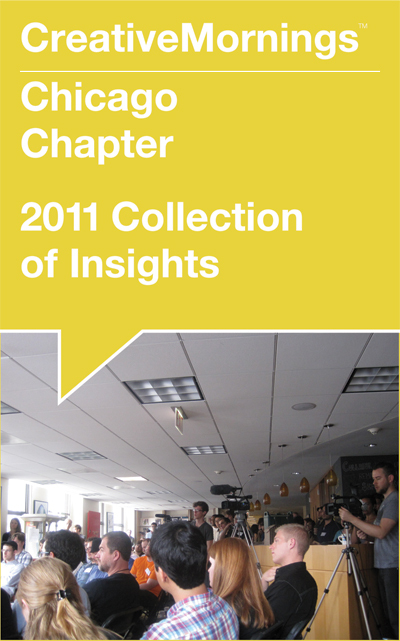 This was the 5th CreativeMornings chapter, established by Mig Reyes. From Brooklyn, New York, the inventor of CreativeMornings, Tina Roth Eisenberg, a.k.a. Swissmiss, gave a warm welcome in person. Jessica Hische and Veronica Corzo-Duchardt were in attendance. Read my write-up and photos. Big thanks: to Braintree, Leo Burnett Department of Design (Host), Onward Search, Deskpass, Natalie’s Orchid Island Juice Company, for being Partners of monthly Chicago CreativeMornings #45; to organizers Kim Knoll and Kyle Eertmoed who both spoke at Chicago CreativeMornings #7; to the team of volunteers for greatly helping to make CreativeMornings happen monthly in Chicago.